June 27, 2013 – Work is expected to start this fall on a $35 million expansion of Brown-Forman’s Woodford Reserve Distillery in Versailles, Kentucky. The expansion will include three new maturation warehouses, along with additional stills and bottling capacity. 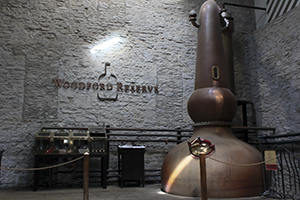 The new stills will be added to the existing stillhouse as needed, joining the three pot stills already in use at Woodford Reserve. The current distillery opened at the site of the historic Labrot & Graham Distillery in 1996 after a major restoration, and has recorded consistent double-digit sales increases each year. In a news release, Master Distiller Chris Morris cited the increasing demand for Bourbon as a reason to prepare for the brand’s future. Brown-Forman will receive approximately $3 million in economic development grants from the Commonwealth of Kentucky for the project, including corporate income tax credits, employee income tax credits, and sales tax rebates on construction supplies and other equipment for the expansion.